The Dynamics 365 upgrade process from Dynamics 2016 has introduced a bug that affects security roles in North52. 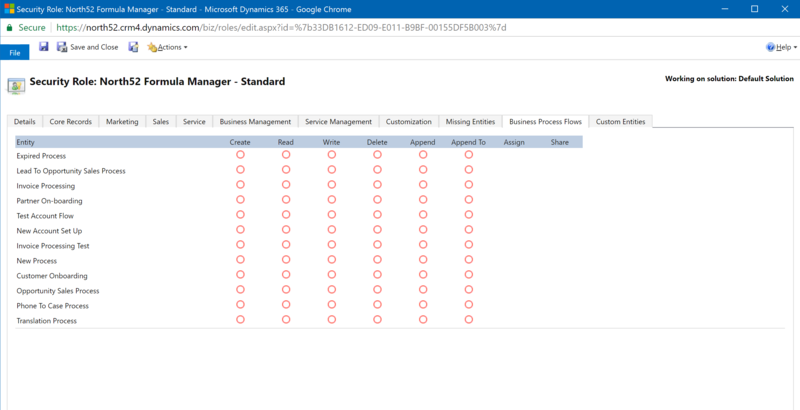 It is not present in new Dynamics 365 installations. Microsoft modifies the existing North52 Security Roles giving them access to Business Process Flows which they should not have. As you can see - these security roles have access to all the Business Process Flows. You will need to disable each of these. Click on each line to clear each security options granted. It is faster to click where the mouse icon is shown in the below image as this will update all options in the row instead of just one at a time. When you have finished clearing all the values, it should look like the below. Make sure to save the security roles afterwards and the issue should be resolved.